This oven is a very versatile, proven performer. With a production rate of 540 lbs. 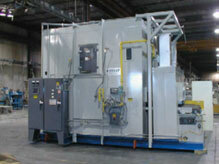 per hour, this CONTINUOUS BELT OVEN is suitable for a wide range of processing needs. The approximate overall dimensions of this package oven are 17 feet long X 9 feet wide X 14 feet high.